Guys, I mean guys, I am so honored. This weekend I reached 700 followers on Instagram. Thank you! Thank you! Thank you! It just blows my mind. Not only does that mean that there are 700 people with nothing better to do than read my posts (kidding) but just think a minute…. those are 700 people who have a chronic illness or who love someone with a chronic illness. Minus the ones who just wanna see cute pictures of Princess Sophie of course!! Seriously though, I want to thank each and every one of you for sharing this journey with me and I hope that I have helped you in some small way at some point. Whether I made you laugh or cry or say, “Yes, me too!” and feel not quite so alone….. I am glad that I can be here for you. I am always available by DM if you need someone to talk to. I know how isolated you can feel. I know how sometimes you just feel like giving up. So message me if you need someone to talk to. Or if you have specific questions. I hope to do more informational posts in the future. 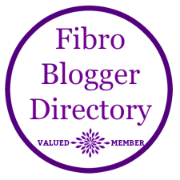 I just feel like there are so many of those out there and I prefer to let you see what life with fibro is really like and try to lend support to you when you need it. Try to make you laugh. Try to inspire you. Don’t forget. WE are WARRIORS!!! You now have another (me!) so you’re at 715 today – huge congrats! Thank you! I find it easier than the blog somehow. I take a lot of pictures too. Thanks for the follow! Hope you enjoy it! !